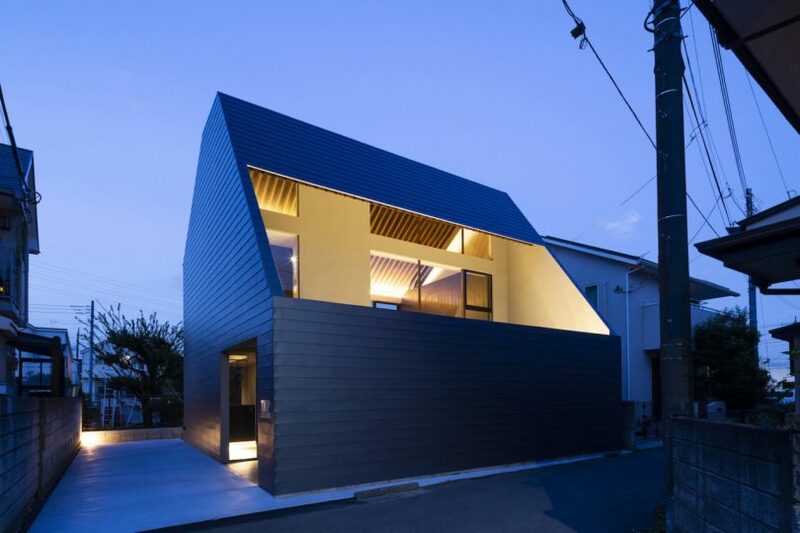 Cover is a minimalist home located in Tokyo, Japan, designed by APOLLO Architects & Associates. The house is situated in a high-density residential neighborhood, and is characterized by a galvanized metallic grey facade. The metal exterior forms the structural skin as well as provide privacy for the residents. A large opening was formed along the roof in order to provide abundant natural light to the interiors, as well as create an outdoor courtyard space, which seamlessly integrates with the main living area via a series of sliding glass doors. The upper level features double-height ceilings and is characterized by exposed rafters that open up the space. The architects describe the home as a comfortable bed-and-breakfast where family and friends can enjoy a meal down below, and then relax upstairs.